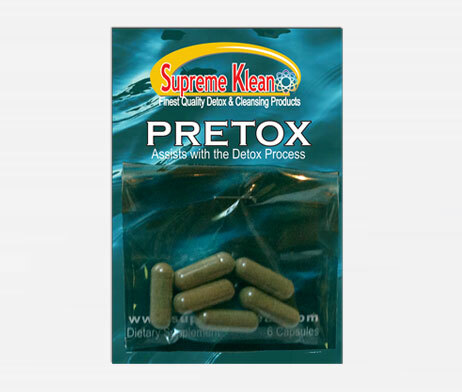 Pretox is an invaluable tool for assisting you in the process of detoxification. It works alongside Ultra Klean detox drinks or Quick Flush to help cleanse the urine in your system prior to taking a urinary drug test. 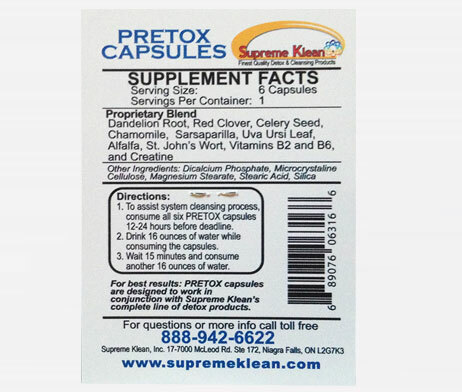 The Supreme Klean Pre-Tox Capsules help assist the process of cleaning your system prior to passing a drug test. Pre Tox capsules are designed to be used in conjunction with any other products and should not be used alone to pass a drug test. After taking the capsules, individuals should be prepared to urinate frequently. The capsule temporarily speeds up the urinary process during which the body breaks down any toxins or drug metabolites. SKU: 1023. Category: Urine Drug Testing. Need a little of a boost. What this Pretox Boost product does is work prior to a drug test to help clean out your system. The Pretox capsules have been created solely for the purpose of assisting other detox products. Do not use this on its own. Pretox Boost causes you to urinate more quickly, and therefore free your body of drug metabolites. Taken with another aid this can be an invaluable supplement. To assist System Cleansing Process consume all 6 PRETOX Capsules. Drink 16 ounces of water while consuming the capsules. Wait 15 minutes and consume another 16 ounces of water.